Malish Diamabrush concrete polishing polymer blades retainers starting from 12 inch to 20 inch pads. The first step in the Diamabrush Concrete Polishing System involves abrading the surface to prepare it for polishing. The Diamabrush Concrete Prep Tool consists of a super tough 25 or 100 diamond grit that is bonded to a metallic backing and assembled to flexible, steel spring blades. The flexibility of the blade helps ensure that the diamond insert remains in constant contact with the floor, regardless of imperfections to the cracked and damaged floor. This maximizes the effectiveness of the tool. As you use the Concrete Prep Tool, multiple layers of diamonds on the blades are constantly exposed, giving the tool a longer life. The patent pending Concrete Prep Tool can be refurbished by simply replacing the blades. The process is easy. Simply order a replacement kit, loosen two screws, replace the blade, and then re-tighten the screws. It's just that simple. Use the coarse 50 grit Gold polymer and proceed as you would with your regular floor cleaning routine. After a few passes using the 50 grit, the system progresses to the next grit. Grit progression is as follows; Step 2 - 50 grit Gold, Step 3 - 100 grit Black, Step 4 - 200 grit Blue, Step 5 - 400 grit Green, Step 6 - 1000 grit Red, Step 7 - 2000 grit Tan. Progressing thru a series of increasing finer diamond grits, the pores of the concrete are progressively closed, ultimately resulting in a retail-like finish. Step 2 (100 Grit), Step 3 (200 Grit), Step 4 (400 Grit), Step 5 (1000 Grit), Step 6 (2000 Grit). The Diamabrush Concrete Floor Polishing System depends on the use of increasingly fine grit polymer inserts. Just like with the Concrete Prep Tool, each Concrete Polishing Tool includes flexible blades that allow the diamonds to remain in constant contact with the floor. 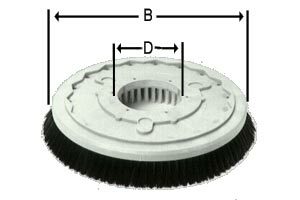 The polymer blades are designed around removable, slotted retainers. Instead of having to replace the entire tool due to wear and tear, simply order a blade replacement kit. All polymers are easily removed and easily replaced, which enhances the life of the tool. Refurbishing a hardwood floor is easy with the Diamabrush Hardwood Prep Tool. Designed to remove polyurethane and carpet adhesives from hardwood floors, the Diamabrush Hardwood Prep Tool effectively prepares the floor for refinishing. The diamond cutting surface of the Hardwood Prep Tool easily removes the mess that caramelized sandpaper can create. The diamond cutting surface remains free of melted or gummed up coatings and maintains sharp points throughout the life of the tool. Like other Diamabrush products, the Hardwood Prep Tool includes replaceable blades. Once the tool gets worn, simply order a Hardwood Blade Replacement kit. The inserts are easy to remove and easy to replace. Removing stubborn coatings like mastic, carpet, tile adhesive, thinnest or thin mil coating is always a challenging job. Fortunately, the Diamabrush Mastic Removal Tool is the ideal solution to the problem. The tool has diverse capabilities and can mount to any standard floor buffer or auto-scrubber. The diamond-coated blades easily grind stubborn coatings away, eliminating the need for any scraping. User safety is greatly enhanced because dangerous and volatile chemicals are not required. Simply apply water to eliminate dust and debris. Like other Diamabrush products, the Mastic Removal Tool includes replaceable blades. Once the tool gets worn, simply order a Mastic Blade replacement kit. The inserts are easy to remove and easy to replace. When you have this information, please proceed to the Manufacturer/Brand Specific Equipment Reference List section of this web site. The machine manufacturers are listed in alphabetical order. Once your brand of machine is found, continue down until you find the correct model. By reading across, you can then determine the proper brush or pad driver size as well as the correct clutch plate. Brushes By Size 10" thru 21"
Bonnet, Pad, Sanding Drivers By Size 10" thru 22"